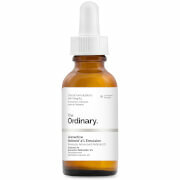 Vitamins A and E are combined to produce a formidable weapon against dryness, acne scarring, and wrinkles. Tissue regeneration is boosted and cells repaired, whilst powerful antioxidants protect against free radical attack. Retinyl Propionate 0.5% (Vitamin A), Retinol 0.5% (Vitamin A), Tocopherol Phosphate 1% (Vitamin E), Ferulic Acidå.